One important prospect of global change in climate that has received ample attention is the sharp rise in the CO2 concentration and its effects on plant growth and functioning. The increased CO2 concentration in the atmosphere is believed to provide enhanced fertilization to plant growth, especially for C3 crops (Derner et al., 2003). The IPCC FAR3 (2007) concluded that in isolation of climate change, an atmospheric concentration of 550 ppm CO2 would result in productivity increases of 10-20%, with increases of 0-10% for C4 crops. When the combined effects of enhanced CO2 are taken into account with temperature increases, the productivity gains are likely to be cancelled out. There continues to be great uncertainty associated with estimates of CO2 fertilization thanks to a number of experimental complications which we will briefly address later in this section. Recent literature continues to question the true level of fertilization, suggesting it to be lower than originally thought (e.g. Woodward, 2002; Long et al, 2006). Even pre-dating the global change concerns, the effects of atmospheric CO2 enrichment have been studied for more than a century in greenhouses, open-top chamber and other enclosures to confine the CO2 gas around the experimental plants (Kimball et al., 2002). In these experiments the scientific basis of physiological responses on the level of plant individuals to elevated CO2 could be well established. A reduced stomatal conductance under elevated CO2 conditions leads to reduced water loss through transpiration. This in turn is reported to increase water-use and light-use efficiency. Through the CO2-concentration effects on the growth regulation protein ribulose-1,5-bisphosphate carboxylase/oxygenase (Rubisco), a higher rate of photosynthesis can be observed (Drake et al., 1997). This stimulation of photosynthesis is greater in plants that fix N and have additional carbohydrate sinks in their nodules which can be found in many food crops and forages such as beans, peas, groundnuts or white clover (Ainsworth and Long, 2005). The prospective changes in production of the major grain and legume arable crops are predicted to show great spatial variance with anticipated production gains in the temperate and boreal regions and production losses in large parts of the tropics. While these diametric changes occur, the global food supply is expected to remain almost constant. This optimistic view comes from the belief that an elevated CO2 concentration will offset the production losses anticipated because of higher temperatures and changed precipitation regimes. Evidence for this large response to elevated CO2 is largely based on studies made within small chambers at small scales, which would be considered unacceptable for standard agronomic trials of new cultivars or agrochemicals. 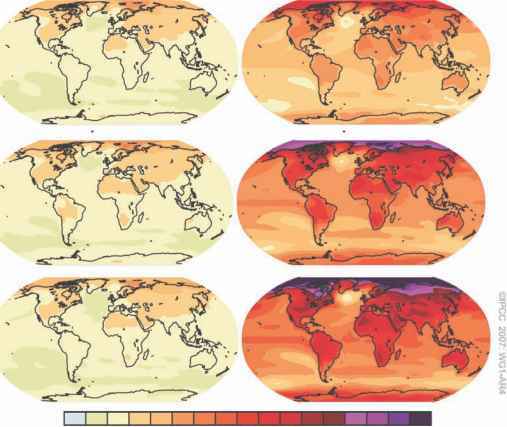 Nevertheless estimates of the ability of the globe to feed itself are almost entirely dependent on data gained in such facilities (Long et al., 2005). Literally thousands of experimental studies have evaluated the response of crops to the increases in atmospheric CO2 concentrations expected to occur this century (reviewed in Kimball et al., 2002) but most information has been derived from experimental studies that used greenhouses, artificially illuminated controlled environmental chambers, transparent field enclosures or open-top chambers. There have been large concerns that these enclosures do not realistically reflect the conditions in future open fields since they suffer from a number of experimental constraints and disregard important effects such as the influence of open-field winds on CO2 dispersal. Furthermore the effects of elevated CO2 have been studied with non-limiting supply of water and nutrients, and temperatures have been kept near the optimum for crop growth (Fuhrer, 2003). Large-scale free-air CO2 enrichment (FACE) experiments allow the exposure of plants to elevated CO2 concentrations under close to natural and fully open-air conditions. Table 2.2 shows the major FACE experiments that have been conducted around the globe. These experiments have focused largely on temperate ecosystems, while tropical, boreal and arctic systems have been largely ignored. Any serious commitment to discovering the response of the terrestrial biosphere to atmospheric change will critically require inclusion of these key biomes (Ainsworth and Long, 2005). Table 2.2. Overview of large-scale free-air CO2 enrichment (FACE) facilities on food crops (Ainsworth and Long, 2005). concentration effects on yields of C3 food crops (wheat and rice). Several plant-level feedbacks are known to prevent additional investment in reproduction, such that yield fails to reflect fully the increase in whole plant carbon uptake. The discrepancies between the results of open-top chambers and other enclosures and the FACE experiments have wide importance as the chamber values have formed the basis for projecting global and regional food supply, and the stimulation attributed to elevated CO2 concentration has commonly been presumed to offset yield losses that would otherwise result from increased stresses, including higher temperature, elevated ground-level ozone and changes in soil moisture (Ainsworth and Long, 2005). Even though the FACE experiments already more-or-less realistically reflect field conditions and enable us to estimate climate change's effect on agricultural production more accurately, they nevertheless suffer from a number of shortcomings. For one, there is the concern that most elevated CO2 experiments only run for 5 years or fewer, and thus may not capture longer-term effects, especially acclimation phenomena or downregulation to the higher CO2 levels. Measurements have shown that with prolonged exposure to elevated atmospheric CO2, the photosynthetic rate gradually declined, approaching or becoming even less than the rate under ambient conditions (Tang and Liren, 1998). Steffen and Canadell (2005) argue that the confidence in the reliability of the knowledge base on the effects of elevated CO2 is rather low. Difficulties arise when models, which are usually based on empirical relationships, are to be used for policy development. The effects of elevated CO2 cannot be disentangled from the effects of climate change on agricultural production systems. Thus, when the cumulative and interactive impacts of elevated CO2 and climate change are considered, our confidence in the reliability of the knowledge base for policy development has to be low. More extensive FACE experimentation with the major crops and within the major growing zones will allow better forecasting of the future food supply, given that predictions currently based on chamber experiments appear very optimistic.